One of the first things is to create long handles that extend beyond the width of the mechanism when it's closed. This way, when you retract it, it doesn't slam down on your hands. To make it sturdy, you'll want to alternate between single bars of metal and double bars that sandwich the singles as shown in this closeup. 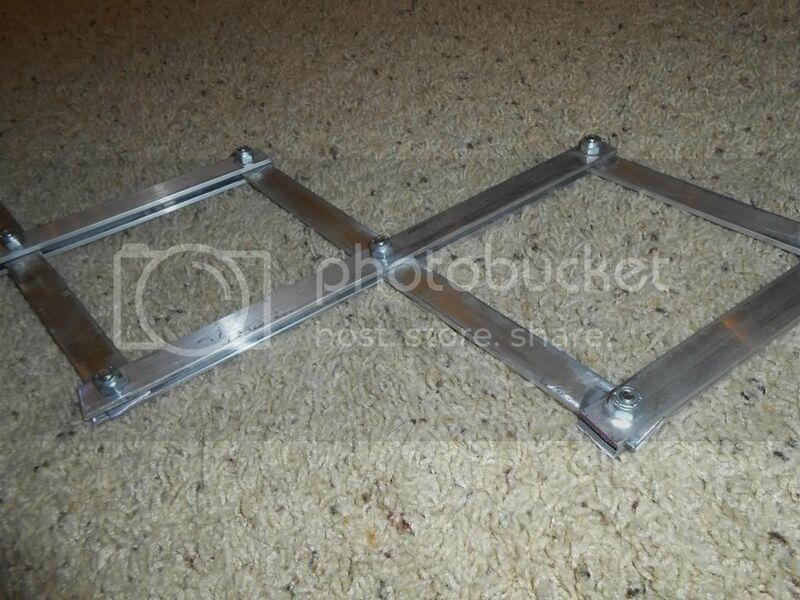 I used 1/8" thick by 3/4" wide aluminum barstock held together by 1/4" bolts with locknuts, all of which can be found at Lowes or other major hardware stores. 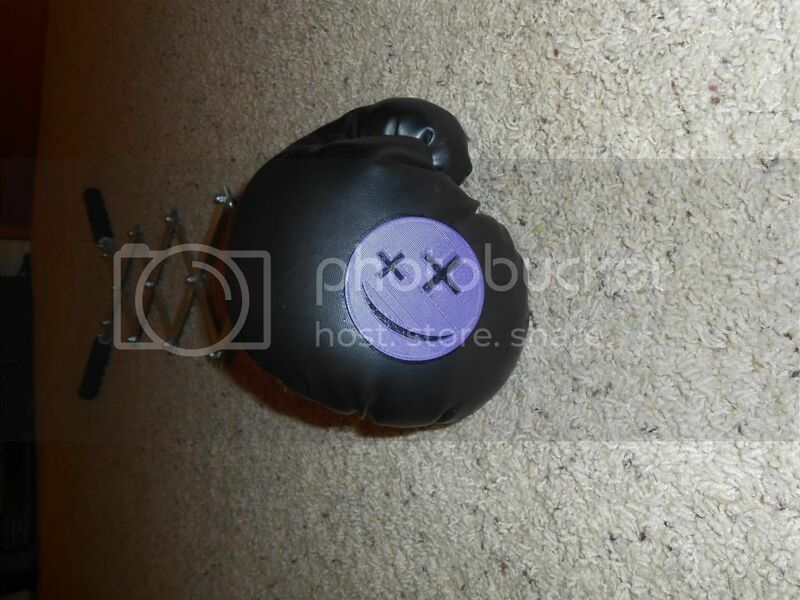 Just for fun, and because this is for the Joker, I decided to add a silly face on the business end of the device! 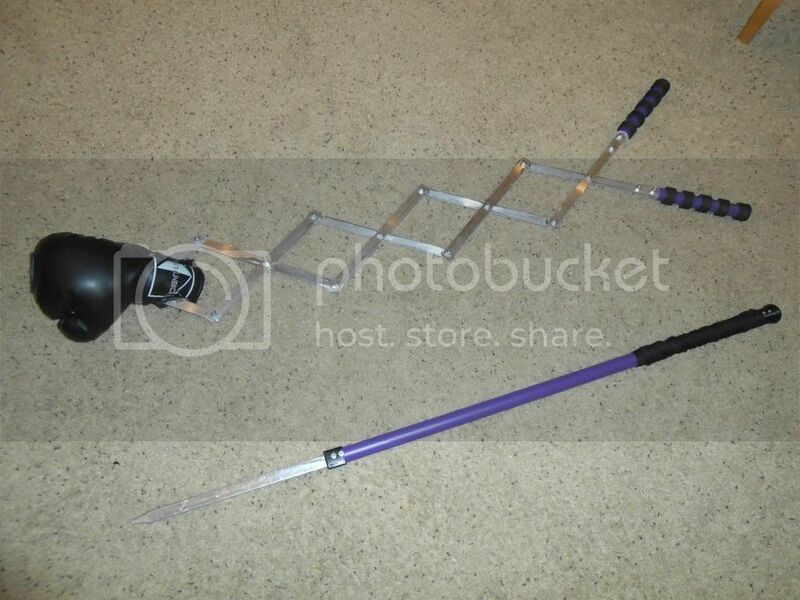 I won't be giving any info on how to build the cane (sorry!) as it's actually something that could, potentially, get you into serious, SERIOUS trouble if you build it outside of compliance with your local laws and then carry it around where you live. Secondly, it could potentially be built in a very dangerous fashion. 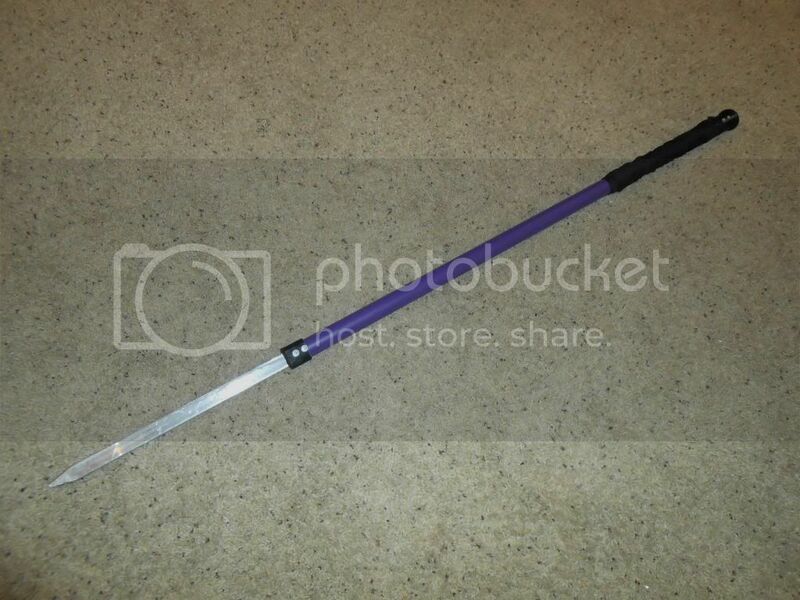 I have to stress that this is a prop only and is completely blunt with no sharp surfaces whatsoever. 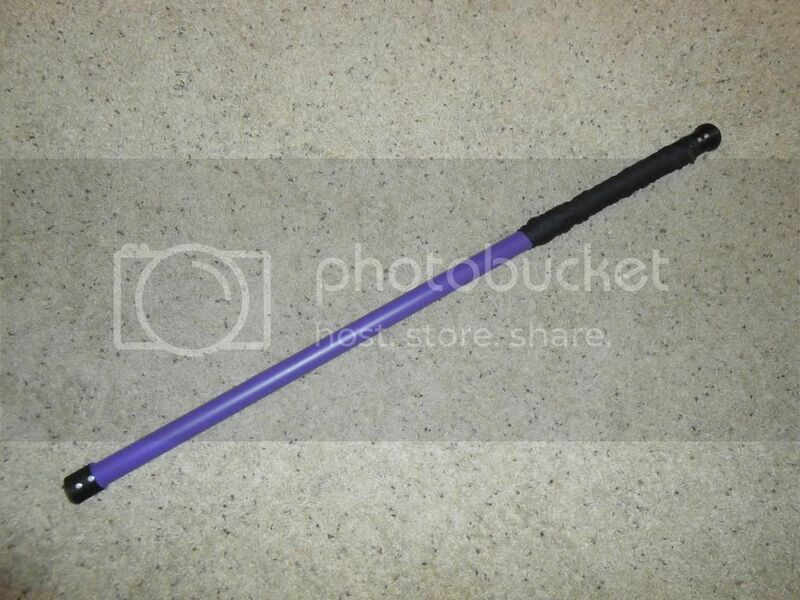 All of that being said, a basic description is that there is a light-weight spring mechanism inside the cane that will lock into the closed position when the tip of the cane is pressed against the ground. 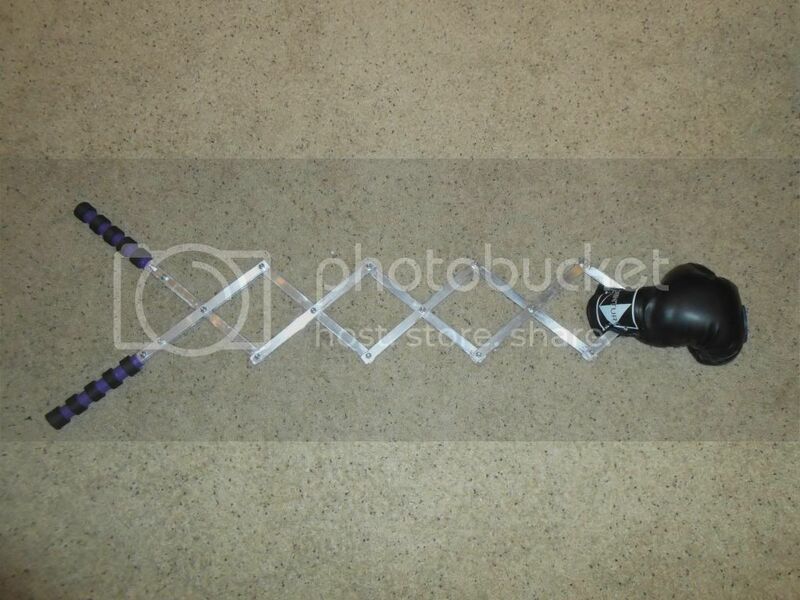 Then, by pressing on a button hidden underneath the cloth grip on the handle, it releases the mechanism and reveals the 13 inch fake blade. A long while back I embarked upon a quest to build a very strange instrument that I had imagined. The end result is an acoustic, human powered, portable, wearable reed organ. I've taken to calling it the "Borgan"
To make the borgan, I used two old accordions that were in need of repair. Both of their button-boxes were shot, but the keyboard and bellows from both instruments only needed a little bit of TLC. So they were given new life within this strange frame. 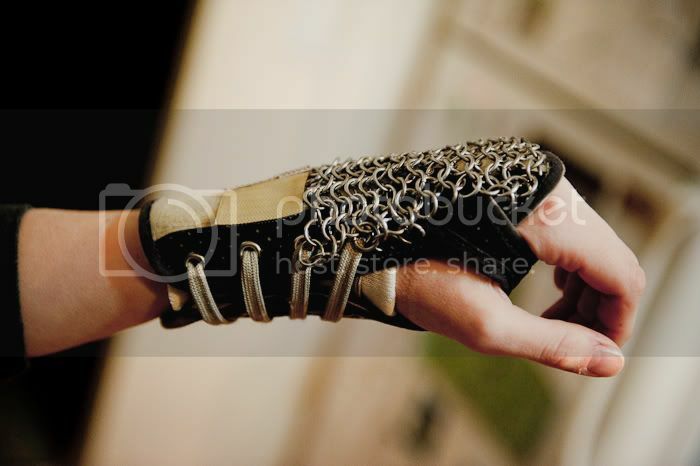 The hand is made from an aluminum frame to form the "skeleton" and EVA foam to create the armored exterior. Color was done with spraypaint. 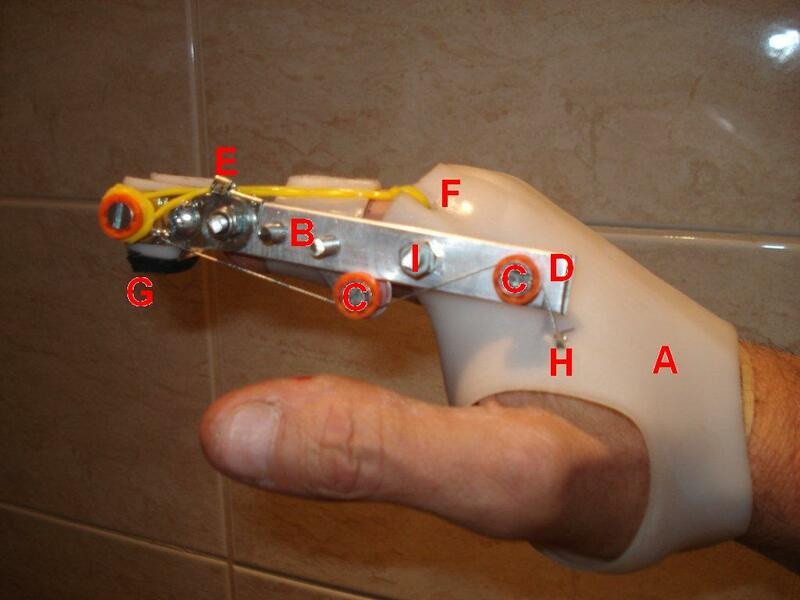 At each joint springs are used to return the fingers to a neutral position. 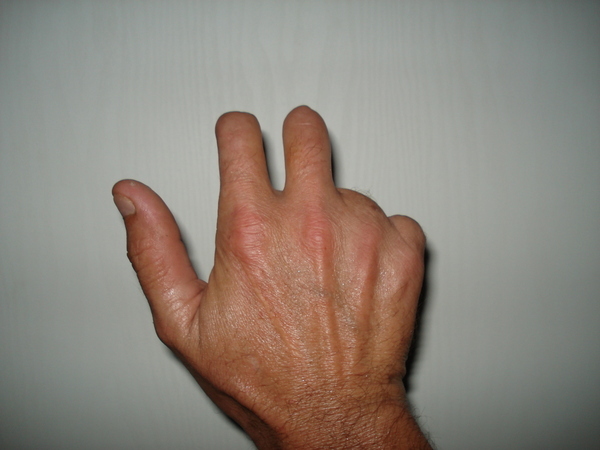 Motion of the fingers is achieved via loops worn on the wearer's (or "puppeteer's" if you like) fingers. The skulls are fabricated from white plastic and the domes over the red LED lights are made from a semi-translucent plastic. My awesome wife went to a garage sale the other day, and bought something for me. 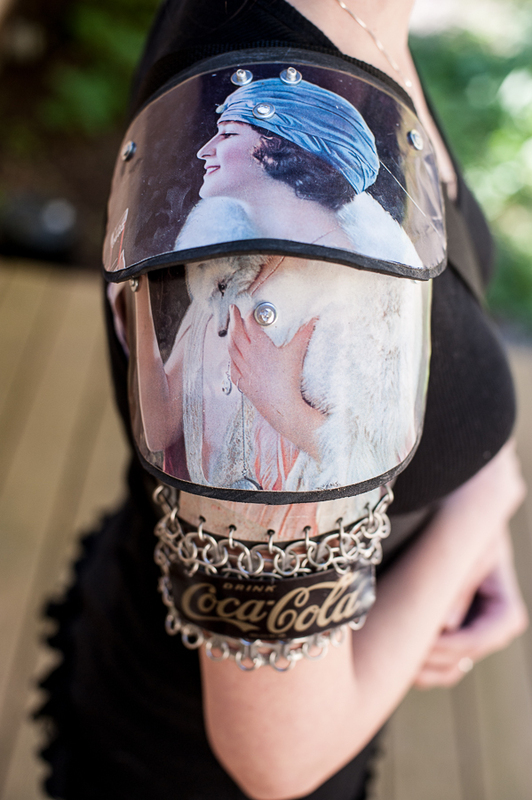 It was a vintage steel Coca-Cola snack tray. It was a bit banged up and had some dents etc. in it… but that made me happy as I therefore wouldn’t feel bad about cutting it apart. 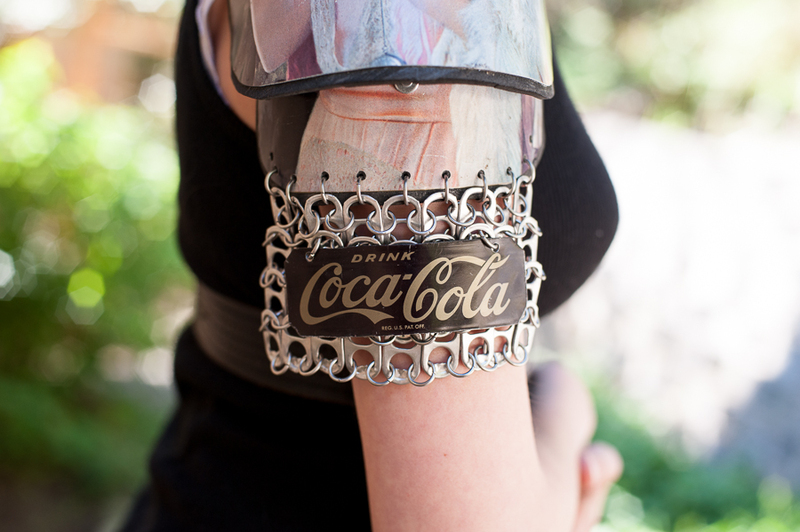 For the post apocalyptic lady who thirsts for adventure. ….. am I the only one who finds the dead fox draped across the lady’s shoulders a tad weird? It looks like it’s trying to bite her finger. Seek vengeance, Mr. Fox, VENGEANCE!!! One of the best aspects of this current design is that much of it was constructed from things one can find at a hardware store. The main lever arm & mounting arm for the tip were made from a brass door hinge. The control ring was made from a plumbing fitting. 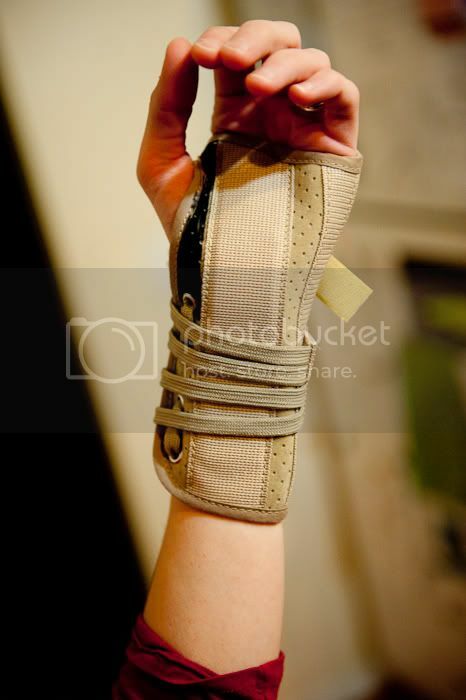 The grip-pad on the finger tip was made from a pad that you can buy to stick underneath table legs. The sleeve to provide padding for his stump is a finger-grip that office workers use when sifting through stacks of paper. 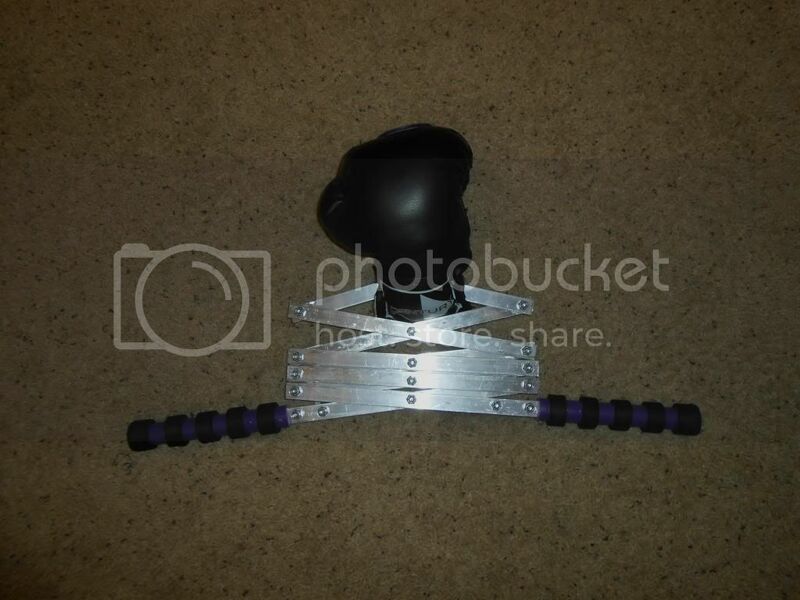 The only specialty components involved in this design are the orthopedic plastic used to create the hand-mount (usually obtained via a doctor or physical therapist) and the tiny ball-joints (the little ball joints are used in RC cars and can be obtained via a hobby shop or online store). 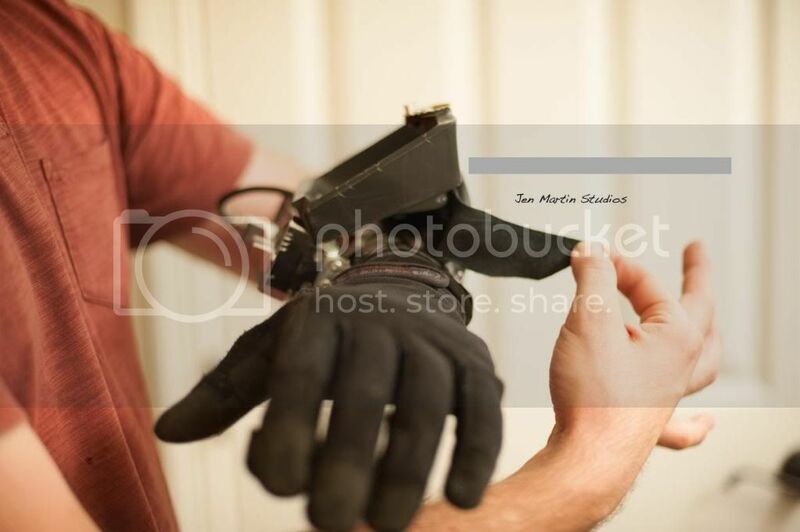 A while back I posted on this board sharing an open-source prosthetic project I'm involved in. I just got back from a trip where my design partner and I got to work together in-person for the first time. 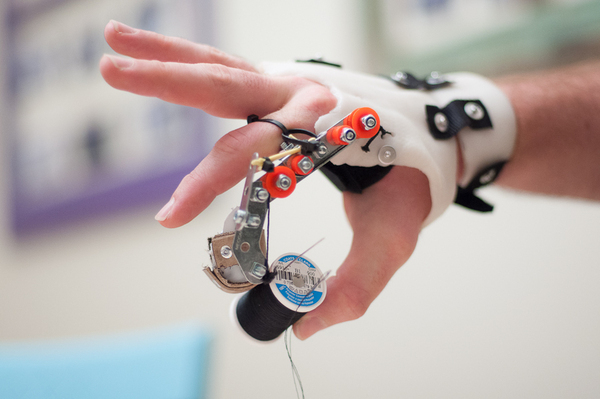 An exciting new development: we were able to start developing a design for a little boy who was born without fingers on his right hand. In line with the goals of our project, Liam (the awesome little fellow) is receiving what we come up with free of charge. 6 days, 20,000 miles of traveling, many hours of work... it was excellent. There is an unbelievable amount to share, but I'm too worn out at this point. Hopefully the images and video will help to give a picture of the process and results. Thank you to everyone in the Craftster Community who has been so supportive and encouraging! I recently made this for a client of mine. 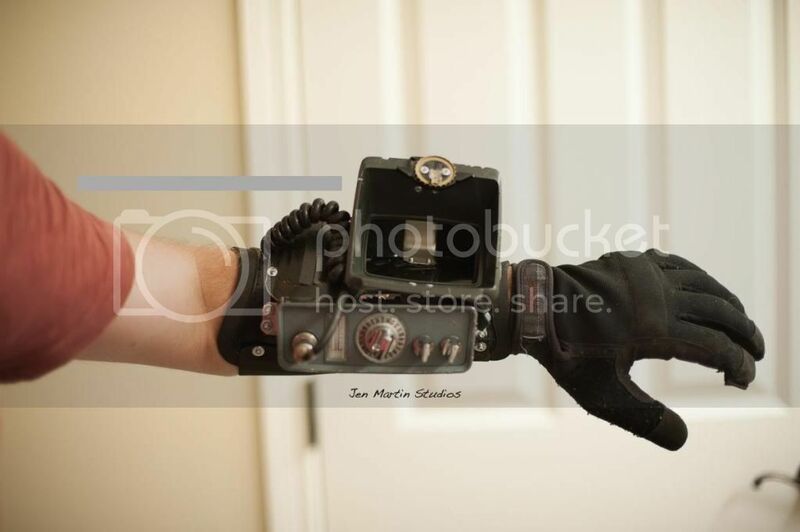 He wanted me to make a re-imagined version of the Pip-Boy from the Fallout games. So, what I constructed is what I imagined the Pip-Boy would end up looking like after a decade or so in the wastes: Rough, gritty, almost all of its' components replaced with scavenged bits of tech as the original pieces, one by one, either broke down or were smashed in fights with mutants. The control panel and speaker grill were stripped off a vintage CB radio (manufactured in the early 70's). The screen housing was also taken from a piece of 70's tech: an old 35mm film editing machine. To prepare the bits of the CB radio, I dismantled it, removed the face plate (which was that plastic, fake wood pattern ever-so-popularly used in the 70's) and repainted it with a flat grey primer. The screen housing was easier, I just had to cut it off of the film editor. The little gizmo on the top is a gear mechanism for advancing the 35mm film. When you spin the large wheel, the little wheel spins rapidly. It serves no purpose but is very fun. There is a compartment below the screen housing into which a smart phone can be inserted. The flap then is wrapped back around to cover the edge of the phone (the phone used as an example is larger than my client's, hence it sticks out a bit.) I left the screen housing open by removing it's old screen cover. That way, one can interact with the smart phone inside. The entire back of the Pip-Boy is covered in black leather. 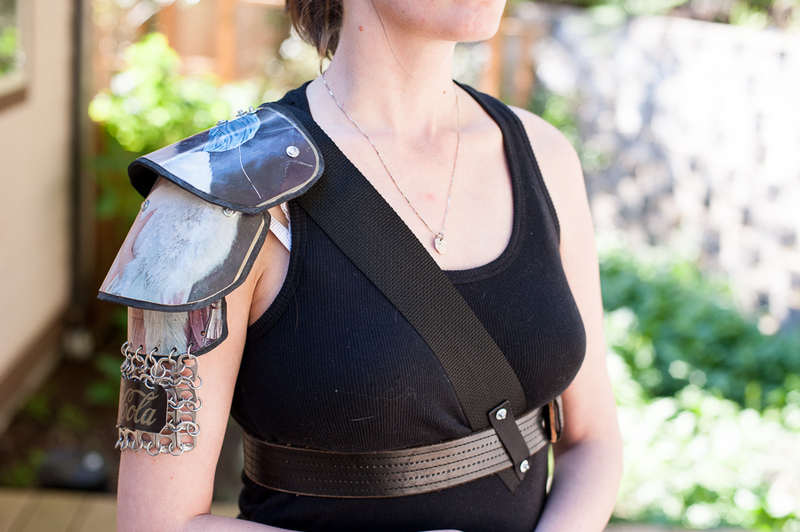 Every piece of post-apocalyptic wear is better with leather. 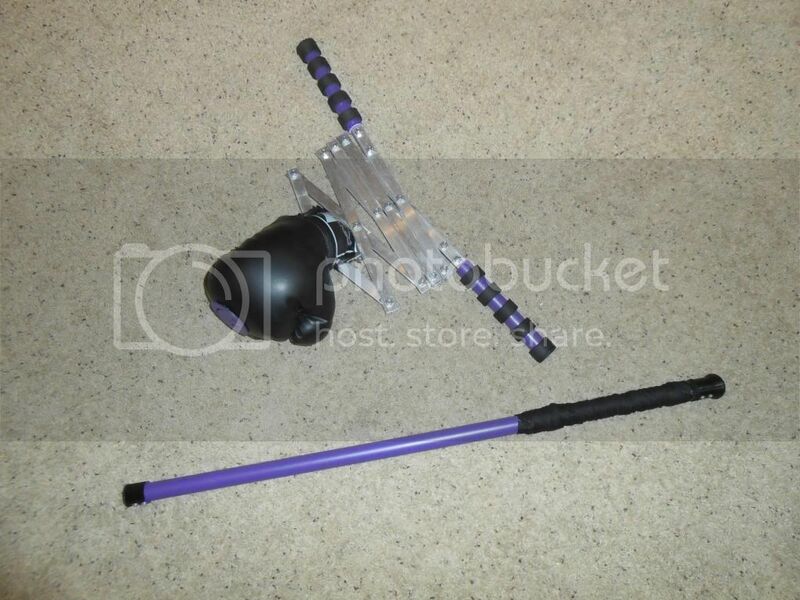 And sports equipment. LOTS of sports equipment. Tina Turner's guards in bartertown would've been in a bad place without their sports equipment. 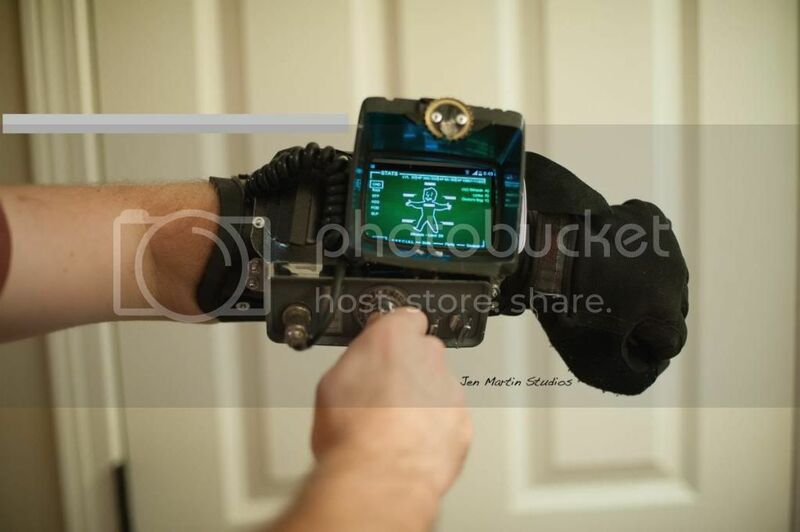 But I digress..... the Pip-Boy is attached to the forearm with stretchy & comfortable broad elastic straps. As you can see from the status of all of the limbs... this vault-dweller is a-okay! We aren't patenting the design; instead we're giving the knowledge away for free. I thought Craftster might be a good place to share some info on the construction of this device. 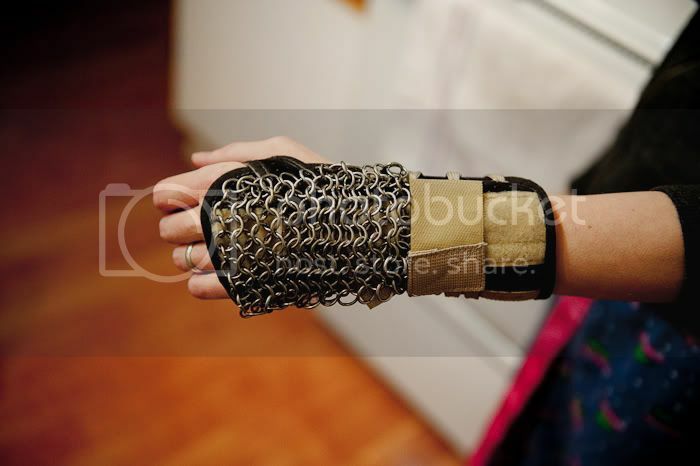 We don't have photos of the complete process yet (mostly because we haven't perfected all the steps, lol ) but I would like to share with you, at least, the wonders of an amazing material called "thermoplastic"!!!! Thermoplastic, I'm fairly certain, has been imbued with magical properties by some sort of ancient race of mythical creatures. It's more likely that it's just a marvel of modern chemistry.... but imagining it being created magically is more exciting. This is the first time I've worked with it and it's indescribably useful. You cut out your pattern and then immerse the piece of plastic in boiling water for about 20 or 30 seconds. It then turns into a clear, completely flexible material that can stretch and it even adheres to itself! The amazing part, you can take it straight from boiling water, shake off the excess droplets and then handle it without it burning you. It's not even uncomfortably hot. For some reason it's a terrible conductor of heat, but I digress. After preparing the thermoplastic, I use the model of Richard's hand to create whichever part of the mounting system I'm experimenting with. 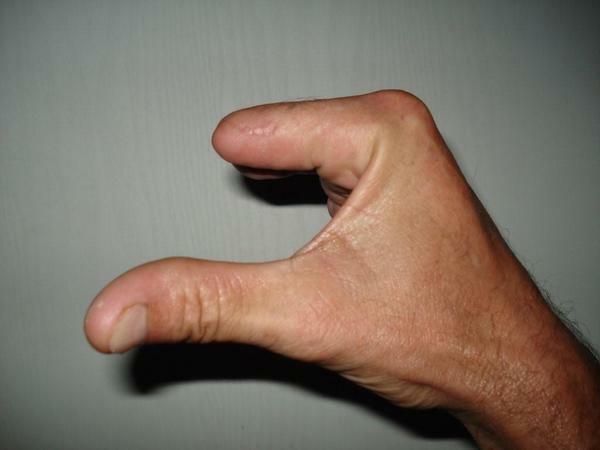 Here you can see me forming it to fit around his index finger stump. The flaps at the top are later bent together and then the thermoplastic fuses to itself. Here I am fusing the flaps at the tip. In front of me is my electric kettle, a measuring cup to hold the boiling water, and a bowl full of ice water. After the part is formed, I immerse the part into the ice water. This cools it rapidly and turns the plastic back into its' high-strength, rigid form. After the hand-mounts are made, then it's a matter of mounting the other hardware and components to the device & sharing what we've made with each other on our Skype brainstorming sessions. 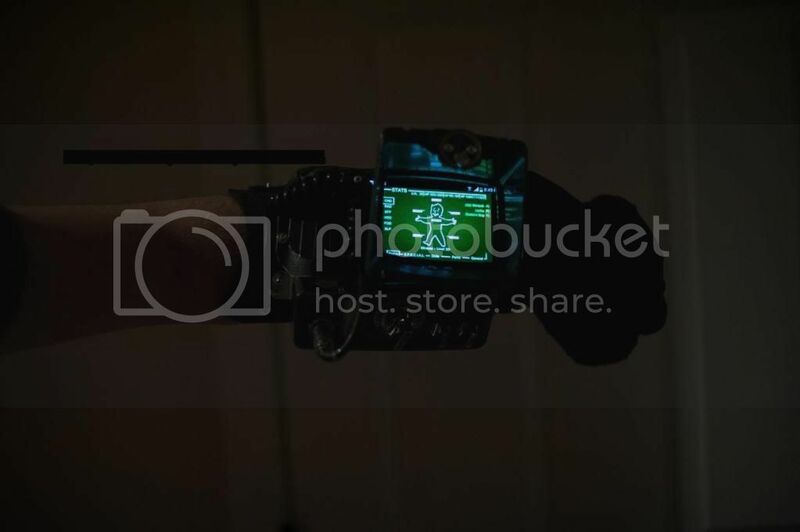 Here's a link to a story on our blog that shows both how we communicate with each other on the project as well as an exciting development! Richard's mind is starting to sort of "feel" with the prosthesis! On 11/17/12 I will be flying over to South Africa to meet Richard in person for the first time and work to finalize our design! For those that are interested, we will be posting video updates on our progress on the fine-tuned version on the site that I linked to above. So I know this very cool guy by the name of Alfred Norris. 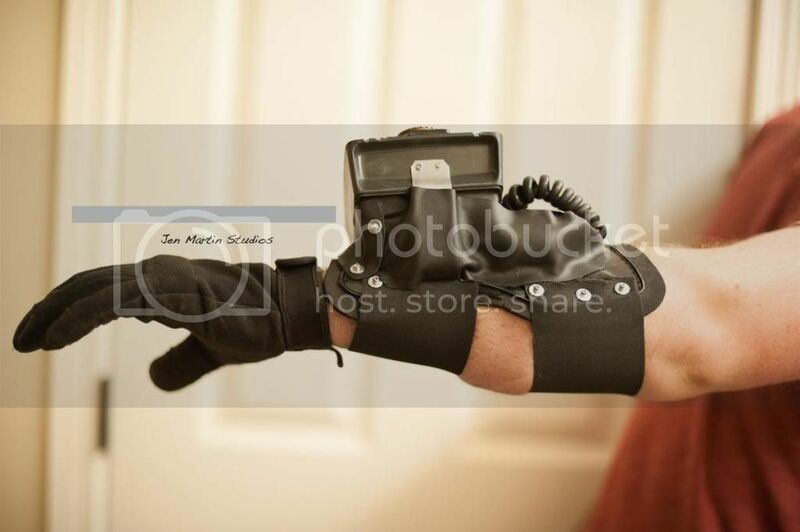 I met him, electronically at least, when he contacted me about commissioning a set of hand mechanics from me. When he told me what said mechanics were for... I can't tell you how excited I was to start the project! 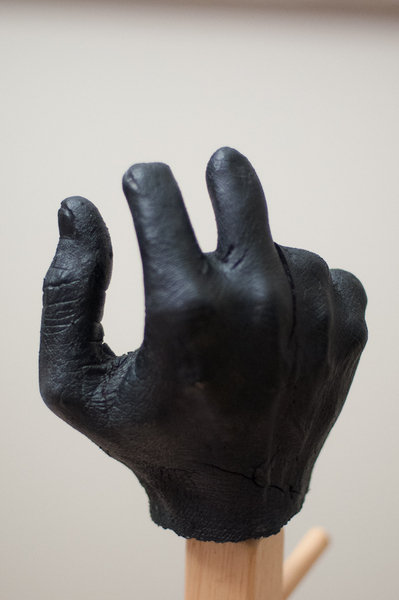 Al and I designed the hands together and I just finished fabricating them last night. Al is making an 8 foot tall hulk costume. I've seen the concept art etc. and it's going to be amazing. When he has finished it, I'll see if I can either get him to post something on Crafster or I'll share it on his behalf. For now, there's a video of the "Skeleton" of the Hulk in action at the end of this post. Hulk's head is going to be located above the head of the "Puppeteer" and his shoulders above where the Puppeteer's elbows are in the video. I'm just shy of 6 feet, so with these on my arm-span is increased to approximately 9.5 feet (Hulk's arms are proportionally larger than a human's when compared to his height... more like a Gorilla than a man). 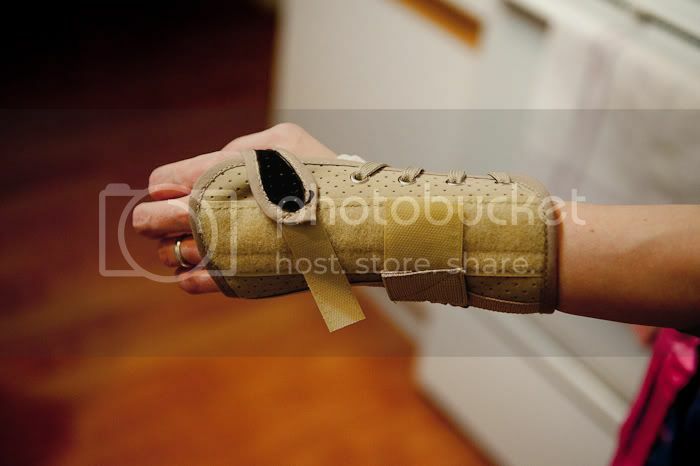 So, my wife had to go to the doctor today because she hyper-extended her wrist a few days ago. 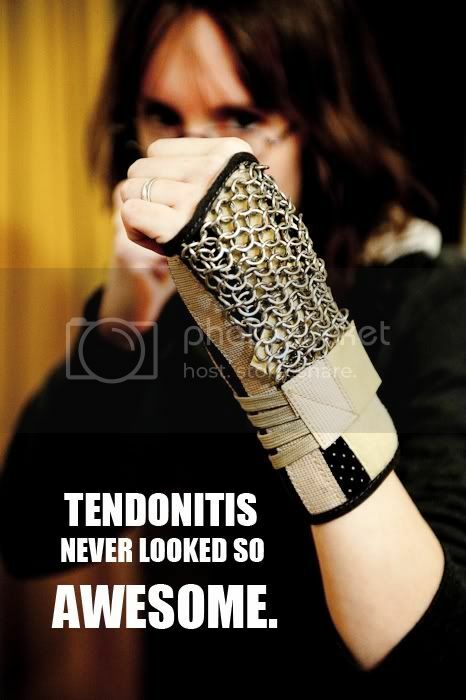 As it turns out, she strained her tendons pretty bad and the doc gave her a brace that she has to wear for the next two weeks. When she got home from the doctor's, she asked me if I would like to decorate it for her. Needless to say, I was very excited to do so! 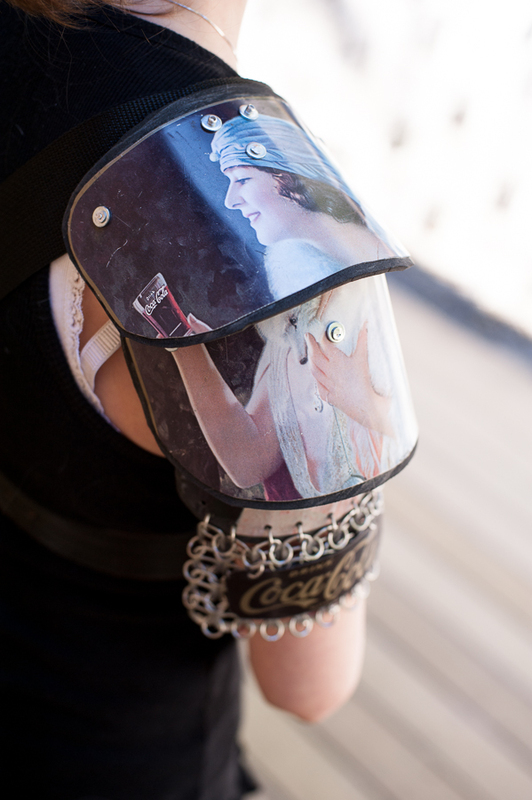 I decided after it was finished that it was no longer a wrist-brace. Far from it. 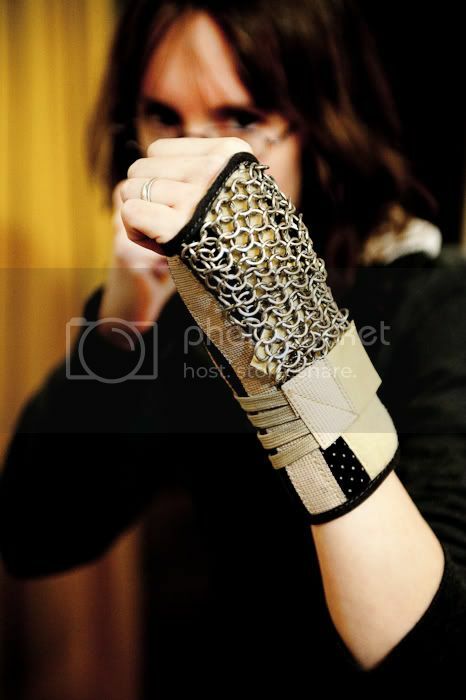 It has now become a futuristic battle-gauntlet that prevents her wrist from snapping back when she fires her super compact, hand-held Railgun. She fires the Railgun with her off-hand, of course, because her dominant hand needs to be free to wield her Tesla Sword!